I always fall in love with all of the beautiful ways to decorate Easter eggs. But when by the time I have let the kids have a go at a dozen eggs each, I lose all interest in boiling and decorating more. But with this idea from Urban Comfort I can let your little ones dye their eggs the traditional way that they love and dress them up with these beautiful stenciled designs. 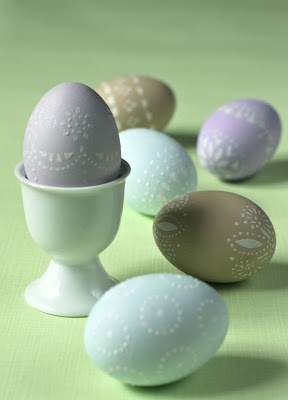 Suzonne Stirling shows you how to create these beautiful eggs using doilies and craft paint. oh, this is a great idea to use on the eggs I just bought at Hobby Lobby today! Really pretty and delicate looking! Happy Spring from Houston,TX! Okay... I REALLY love these.